In the beginning, everything looks and sounds like a rock concert in an intimate space where audience members tiered on either side of the stage will sit on cushions and sip wine from the bar nearby. 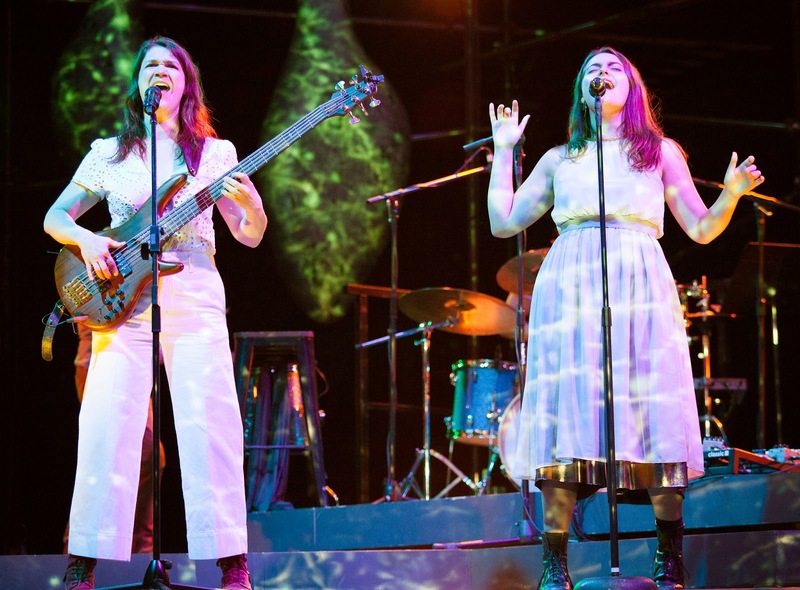 Two women, one straddling a bass guitar, face each other and begin singing a somewhat strange but melodically mesmerizing song entitled “Hollow Bone,” with three band members in the background backing them up on keyboard, electric guitar, and percussion. Slowly -- like the peeling off of light gauze cloth on some precious object underneath -- a story begins to emerge from occasional narrative and a couple more songs. As the evening progresses, the magnetic powers of the music and the increasingly intriguing, beguiling story combine with incredible lighting and projections to enrapture an audience clearly hanging onto each note and line of the unfolding story. 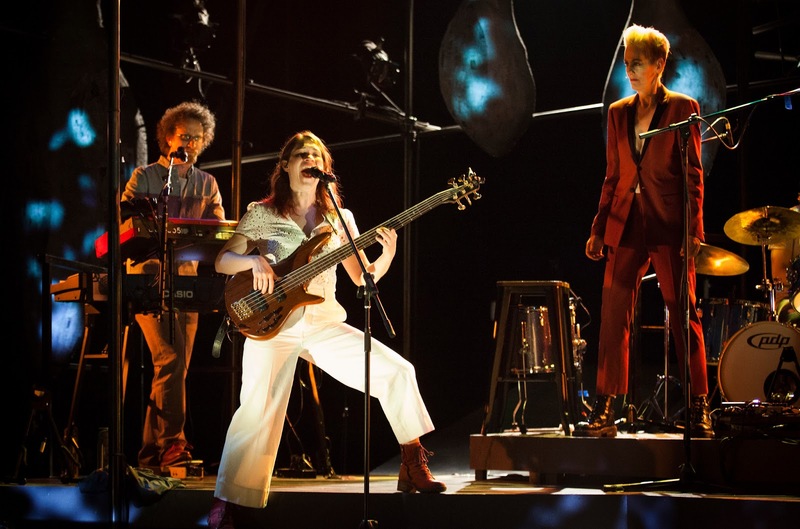 After several years in development and winning along the way awards for the concert-only version, Weightless receives its impressive, innovative world premiere at Z Space, in co-production with Piece by Piece Productions. Kate Kilbane and Dan Moses – the wife/husband team better known as just The Kilbanes – are both authors and composers of what they are touting as a “new rock opera;” but as we the audience witness in this electrifying evening, this is a new work that defies being categorized into any one genre. The music is sometimes hard, pulsating rock but often ventures into sounds of Appalachia, folk, or New Age Indie. The story has roots ancient and haunting, coming from one part of Ovid’s colossal Metamorphosis, a tale about two sisters – Procne and Philomela – who in the Greek version are separated, tormented by an evil god, and willing to risk all to reunite. Taking that story as a beginning point, The Kilbanes have created a mythical, dreamlike Weightless that is timeless, mystical, sad, and triumphant. And in their tale, there is a not a malevolent God but one who observes the story’s unfolding, providing both witty and wise commentary to us as her captured audience. 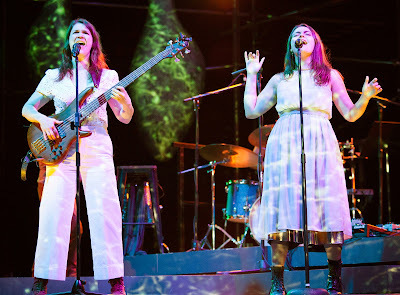 Weightless opens with the sisters singing to each other what are nothing short of love songs. In “Breath and Your Bones,” their voices sing in such close harmony that notes touch up against each other even as they move closer to where their faces are only inches apart. The lyrical melodies are almost other-worldly as they sing, “Your breath and your bones, your heart is my home, wherever I roam.” The song merges into “whoa-oo-aa” rounds of tightly wrapped threads that will become a recurring method common to the Kilbanes hypnotic songs as their rock opera progresses. Both Kate Kilbane as Procne and Lila Blue as Philomela offer voices that blend seamlessly when in duets and stand as individual, memorable signatures when singing solo. Rounding out the cast are two more band members who play key parts in the overall narrative without ever taking on a specific role. Dan Harris is the drummer whose percussion at times has a distinct dialogue all its own to help progress the story. Dan Moses adds sung, background harmonies while also knocking the socks off the keyboards. 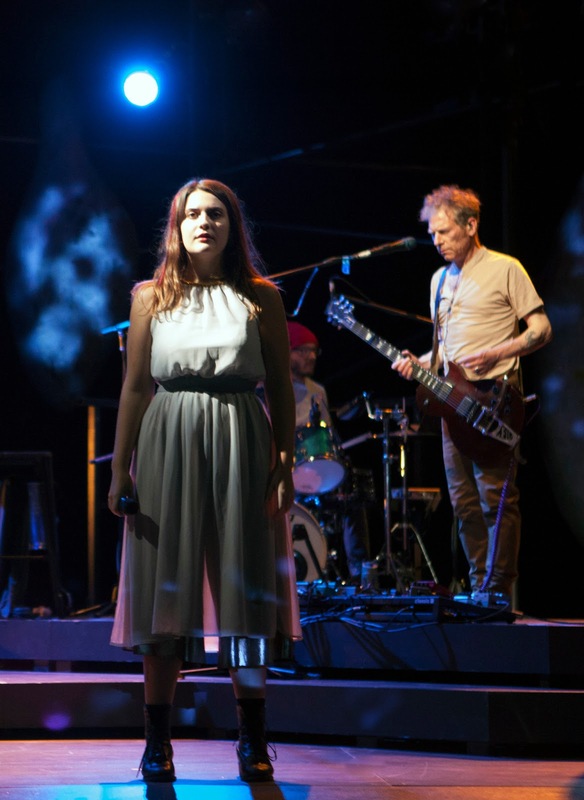 Becca Wolf directs the show in a flow that magically mixes what at times seems like a concert and at other times is clearly a blocked and staged drama with music. The evening’s power and ability to tell a story in ways unique and captivating is greatly enhanced by the projection designs of Hana S. Kim. Illusions of water, forest, beaches, sky, and sheer emotions crawl up and splatter against the long ramp that dominates Angrette McCloskey’s scenic design, while the lighting design of Ray Oppenheimer further enhances both the earthly and the supernatural elements of the rock opera. The evening’s music, narratives, and waves of enveloping sound are all masterfully coordinated and orchestrated by the genius of sound designer, Gregory T. Kuhn. In the song “Weightless,” we hear sung, “My feet are planted on the earth, but I can’t feel the ground ... Weightless, suddenly my heart is flying free.” Leaving Z Space’s world premiere of The Kilbanes Weightless, I for one exited soaring from an evening of music and story that defied categorization but certainly that rocked my soul and heart, ready to tell anyone I saw that this is a ‘must-see’ production. Weightless continues through March 18, 2018 at Z Space, , 470 Florida Street, San Francisco. Tickets are available at http://www.zspace.org/.